According to the recent media beat-up, Melbourne is yet again suffering a wave of “African gang violence”. This is despite Victoria deputy police commissioner Andrew Crisp recently stating that there was “no evidence or intelligence to suggest” a string of recent crimes was gang-related. At a New Year’s Day press conference, prime minister Malcolm Turnbull begged to differ. The PM said he was “very concerned at the growing gang violence and lawlessness in Victoria”. He went on to say it was a failure of “the Andrews Labor government”. Federal health minister Greg Hunt then stepped up to the microphone, stating, “We know that African gang crime in some areas, in particular, is clearly out of control”. The minister proceeded to say the problem was not the police who’d “dropped the ball”, but premier Daniel Andrews. In his typical fashion, home affairs minister Peter Dutton appeared on 2GB radio the following day and backed up his colleagues. Dutton claimed Victorians were too scared to go out to dinner at night for fear of “African gang violence”. Of course, it comes as no surprise that this is an election year in Victoria. And the federal Coalition ministers are starting in early on their “tough on crime” critique of the state Labor party. They even choose to launch their assault at a time when premier Daniel Andrews was on leave. Over the last couple of months, the Herald Sun has been running a series of articles about the rise in crime committed by African gang members, the majority of whom are said to be of Sudanese and South Sudanese origin. Several incidents brought the debate to a head over the last month. On December 13, a group of youths were involved in what was initially a street brawl at St Kilda Esplanade, which later broke out again at a local McDonald’s. An Airbnb property was trashed in Werribee on December 20, after a party that was held at the residence got out of hand. When police showed up at 3.30am, people inside the house pelted officers with rocks. And on Boxing Day, a Victorian police officer was kneeling on the ground trying to arrest a youth for an alleged shoplifting incident at Highpoint Shopping Mall in Maribyrnong. The officer was then surrounded by a group of youths, before being kicked in the face by a 17-year-old male. And while no one is denying that these incidents occurred, there is some dispute as to whether they amount to what could be referred to as gang-related crime. In response to the federal ministers’ comments, Victorian police minister Lisa Neville and Victoria police acting chief commissioner Shane Patton addressed the press on Tuesday. Mr Patton outlined that the police were dealing with each of the three incidents that occurred over recent weeks. On the subject of gangs, the acting chief commissioner said that “from a Victoria police perspective…what we traditionally view as organised crime gangs are those high-level organised crime gangs.” He mentioned an outlaw motorcycle gang as a group that would be classified as such a gang. In regard to the small cohort of African youth offenders, he prefers to refer to them as “networked offenders”: individuals who come together at certain times, but with “no real structure around them”. And he said he doesn’t want to “elevate” these “young thugs” to the level of a gang. Mr Patton further stated that Victoria police are allocating extra resources to deal with these offenders, and they’re also working in collaboration with the African community. He stressed that police were well aware that there was an over-representation of African youth offenders. Back in November 2016, there were reports about a youth crime wave that was sweeping the state. However, over the last decade, youth crime rates have actually fallen, and the crime rate in Victoria has just had its biggest drop in 12 years. Figures from Victoria’s Crime Statistics Agency (CSA) reveal that over the 12 months ending in September 2017, the overall crime rate dropped by 6.2 percent. This was largely due to a fall in car thefts and aggravated burglaries. CSA figures show that in the year 2007-2008 50 percent of crime was perpetrated by people under the age of 25, whereas in 2015-2016 that figure had dropped to 40 percent. And while Sudanese youth are over-represented in the crime figures, they only account for a small fraction of the overall crime rate, when compared with the amount of crimes attributed to youth of Australian and New Zealand backgrounds. People born in Sudan only make up 0.1 percent of the population in Victoria, while in 2016, they accounted for 1.5 percent of the overall crime rate; out of 14,479 crime incidents, 222 were attributed to Sudanese people, which is still a relatively low figure overall. 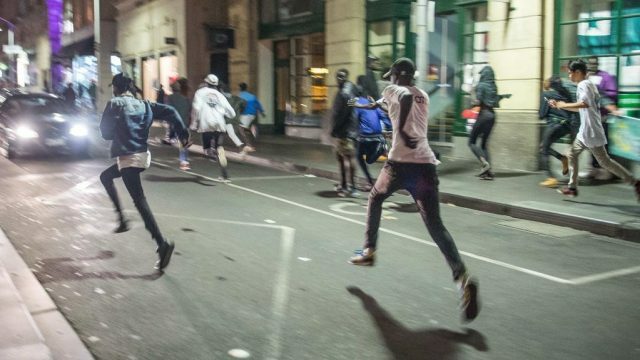 The recent focus on African youth crime began after the March 2016 Moomba festival riots. A brawl broke out between two rival groups in Melbourne, and most of the blame was pinned on the so-called Apex gang. Apex was said to have formed in 2014 in the outer Melbourne suburb of Dandenong. The street gang was reported to be of Sudanese origin. However, following the Moomba riot, police outlined that the group was also made up of Caucasians, Pacific Islanders and Indians. However, there was speculation in the press at the time that the Herald Sun had actually made up the Apex gang, and after the recent incidents in December, that very same News Corp tabloid is reporting that a new African gang has formed. Based on the evidence of some graffiti found at the Airbnb residence, and a few other sites, Menace to Society is evidently the new gang in town. But, behind youth crime in Victoria is a group of young people who are suffering extreme social disadvantage. And this is regardless of these youths’ countries of origin. These are people disengaged from the rest of the society, who need a path in. A quarter of Victoria’s adult prisoners come from just two percent of the state’s postcodes, and half are from six percent, and those young people who grow up in these marginalised areas are more likely to share the same fate as they get older. So, while privileged politicians continue to argue the tough on crime stance in the hope of gaining points in the polls, they’re doing nothing to better the situation. Paul Gregoire is a Sydney-based journalist and writer. He has a focus on drug law reform, gender and Indigenous issues. Paul has written for various publications including VICE Australia and Sydney’s City Hub.